This was one of One Sky's first projects. It involved developing a partnership with Friends of the Earth Sierra Leone in Freetown, Sierra Leone. As part of the project One Sky sent Jason Blanch to work with FOESL for two months. In addition the Executive Director of FOESL visited Canada and our Southern partner CESTA in El Salvador. 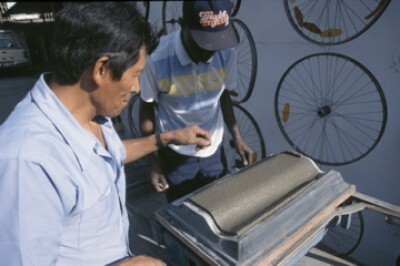 Following an initial visit to El Salvador plans were drawn up to replicate the concept of an eco-centre and the use of appropriate technologies including a pedal powered cement tile making machine. One Sky supported FOESL in developing their organizational structure, developing an internet connection, a network of computers, a solar system to power the office, a bicycle maintenance and mechanic program, a clean up campaign and an organic gardening education project. This first year of programming flowered into a longer term relationship with FOESL that lasted several years.